Help Center - How does SwapaCD work? You have original, playable CDs that you do not want to keep. After you have posted the first 10 CDs to your CD Tower, you get a "gift" credit from SwapaCD to get you started swapping. After that, you earn credits by sending out CDs to others. If you want a CD that is not currently available, you can place it on your Wish List and we will notify you by email when it is available for you to order. You can even have it sent to you automatically when it becomes available, with no email necessary. When a CD is requested from you, we notify you by email, provide the address for you to send it out, and even provide a wrapper! Wrap and mail your CD. When the requestor receives it, you earn 1 credit. Yes, you pay the postage to send out your CDs, but when you request a CD, the sender ships it to you and you pay only the 49-cent transaction fee (plus 1 CD credit per disc)! 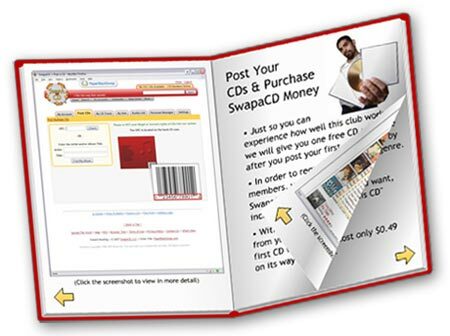 The CDs you receive from SwapaCD are yours. We hope that you will repost them to share with other members when you have listened to them, but you can certainly keep them, or give them away. Similarly, the CDs you send out to others belong to their new owners. What can be swapped here? Do I need to own a computer to use SwapaCD? Do I have to have a printer to use SwapaCD? Do I need to have internet access/email to use SwapaCD? Do I have to check email every day to belong to SwapaCD? Will I get a lot of emails if I join SwapaCD? How much does it cost to mail a CD? Which CDs can be posted on this site?